The idea struck him one day after spotting a billboard as he was driving home from work. When he came to learn that it cost businesses $425 a week to rent the sign space, he decided there should be a more affordable option, especially for small businesses. So in March, Wright State University business student Jacob Hunkeler founded his own advertising company, a creative initiative that uses car magnets, bar codes and strategic driving to deliver commercial messages. 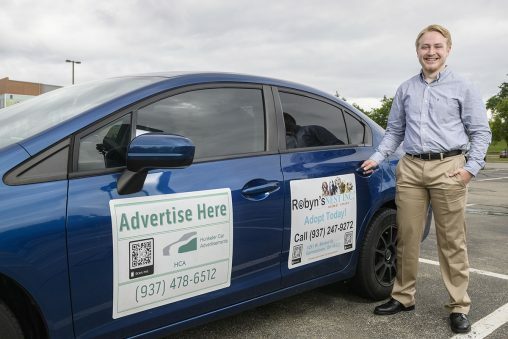 The management information systems major, who also works full time at Dayton Children’s Hospital as a network support analyst, runs Hunkeler Car Advertisements out of his home. Hunkeler purchases lightweight, vinyl car magnets, which are weather-resistant and stick to vehicles even at high speeds. Because of their pliability, they can be peeled right off and replaced with a different magnet as needed. Hunkeler custom designs the magnets. Each one has the company’s logo, contact information and a QR code. The QR codes on the car magnets can be read at a distance, and some smartphones can zoom in on the code if necessary. The vehicles bearing the car magnets are driven in certain zip codes, typically in or around areas where the businesses are located. Rush hours are prime driving times because there are more motorists on the roads and bumper-to-bumper traffic speeds tend to be lower. Drivers who stay in the middle lane of a three-lane highway can potentially get twice the views because there are motorists on both sides. “There is a little bit of a strategy,” Hunkeler said. Hunkeler’s computer software tracks the routes where the cars are driven, the times and even what kind of smartphones are being used to read the QR code. One car alone was scanned 20 different times on a recent outing. “Obviously, we’re looking to improve that number,” he said. Hunkeler employs a 25-vehicle fleet of drivers who put the magnets on their own vehicles, each averaging 42 miles a day. The drivers log the number of miles driven, Hunkeler enters them into an Excel sheet and sends the businesses a bill. Rates start at 55 cents per mile, and there is no fee when the vehicle is parked even though the magnets remain on. For the large magnets, the charge is 95 cents per mile. “Compared to other forms of advertisements, this is way cheaper,” Hunkeler said, adding that it can cost $10,000 to put up your own billboard. Hunkeler first became interested in technology and computers when he was in middle school. After graduating from Xenia High School in 2015, he enrolled at Wright State to study management information systems. Hunkeler said the classes he has taken at Wright State have prepared him well for the business world. Businesses that have used Hunkeler’s car magnet advertising so far include a restaurant, a day care center, a grooming salon and a dog adoption center. “I’m trying to promote local business and also pursue my own dreams,” he said.